Giulia Volpe – Osteopath. Available Sundays. Book an appointment with Giulia. 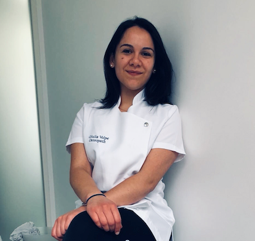 Giulia uses an integrated approach combining craniosacral, visceral and structural techniques, keeping in mind that every patient is unique. She trained at ICOM in Italy and completed her MOst at NESCOT in the UK. Giulia practices fascial release using several gentle techniques that lead to an increase of elasticity within the tissues, and areas of special interest include scars, antenatal care, stress, and whiplash induced injuries. Her treatments are characterised by enthusiasm, positive energy and the ability to cultivate a good patient-practitioner relationship. Outside of osteopathy, she enjoys an active lifestyle, especially horse riding, swimming, yoga and dance. She has been part of a contemporary dance company for 10 years, giving her a useful insight into the physical challenges of performers. Giulia is fluent in Italian and English.